On March 11, 2018, St. Mary’s Seminary & University hosted an ecumenical prayer service for the Roman Catholic Archdiocese of Baltimore and the Delaware-Maryland Synod of the Evangelical Lutheran Church in America. The service in St. Mary’s chapel marked the 500th anniversary of the Reformation with common prayer focused on the journey from conflict to communion. Archbishop William Lori and Bishop William Gohl presided, assisted by Bishop Dennis Madden and Rev. Dr. Eric T. Campbell. 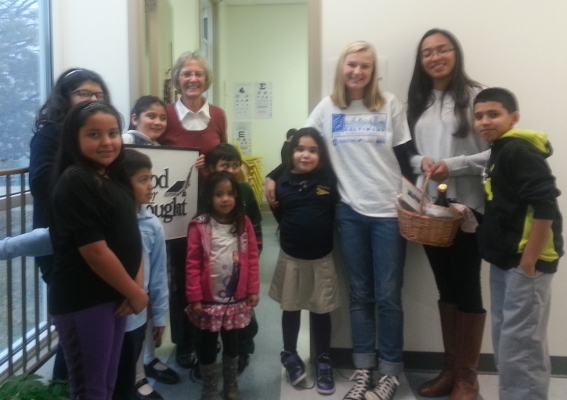 Catholic participants included the St. Mary’s faculty and seminarians, and faculty from Mount St. Mary’s. Lutheran participants included seminarians from United Lutheran Seminary (both the Gettysburg and Philadelphia campuses) and Princeton, area pastors, and Dr. Kathryn Johnson, who traveled from Chicago to represent Presiding Bishop Elizabeth Eaton of the Evangelical Lutheran Church of America. You can read Archbishop Lori’s full homily from the event here. An Ecumenical Institute student was among the first to participate in an intensive course offered by the Religious Freedom Center of the Newseum Institute in Washington, DC. Master of Arts in Theology candidate Michelle Rader is among those featured in this video. Ecumenical Institute students interested in a similar opportunity for Fall 2017 have until May 14 to apply. St. Mary’s Ecumenical Institute congratulates three long-serving colleagues who will enter retirement this summer. Zenaida Bench, Assistant to the Dean, Admissions & Academic Services, will retire after 23 years of service. 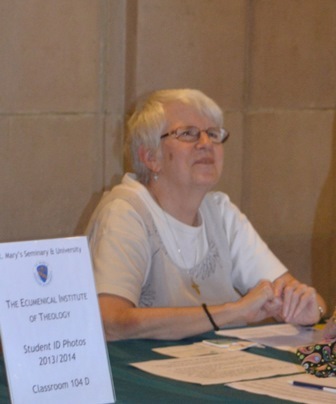 For nearly half of the EI’s existence, Zenaida has been at its center, ensuring that each new cohort of students can enjoy the journey of faith seeking understanding. An EI alum (MAT ’93, CAS ’11), she has used her theological education joyfully in the ministry of administration. In addition, two long-serving EI faculty members will enter retirement. Dr. Art Thomas began teaching in the EI in 1996, teaching courses in spirituality. 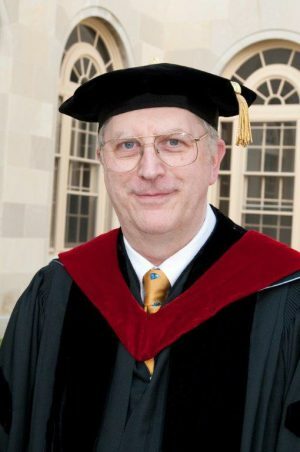 Dr. Thomas is retiring from full time ministry in the Baltimore-Washington Conference of the United Methodist Church, and will be moving to Richmond. 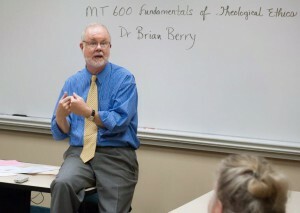 Dr. Brian Berry began teaching in the EI in 1998, teaching moral and systematic theology. He is a permanent Dunning Distinguished Lecturer. Brian is retiring from full time teaching at Notre Dame University of Maryland and will be moving to Ohio along with his wife Susanne. Together, these colleagues have a combined 63 years of service to the EI. We are grateful for their commitment to our mission and generosity with our constituents, knowing that we would not have been as strong a school without them. Each will be celebrated at the annual graduation dinner. 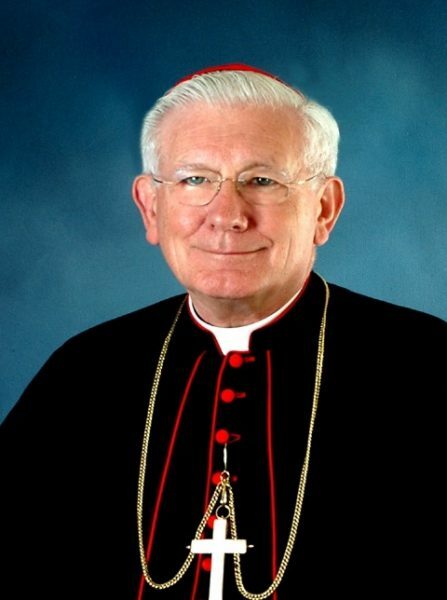 We join Archbishop Lori and the entire Archdiocese of Baltimore in prayer and gratitude for the life of Cardinal William Keeler. In the Sulpician tradition, Cardinal Keeler was the first superior of St. Mary’s Seminary & University during his years of exemplary leadership of the Archdiocese of Baltimore. In 1995 Cardinal Keeler was instrumental in bringing Pope John Paul II to Baltimore, and St. Mary’s Seminary had the honor of being his final visit before departing the area. We remember a great priest, bishop and leader. May he rest in the Lord’s peace. 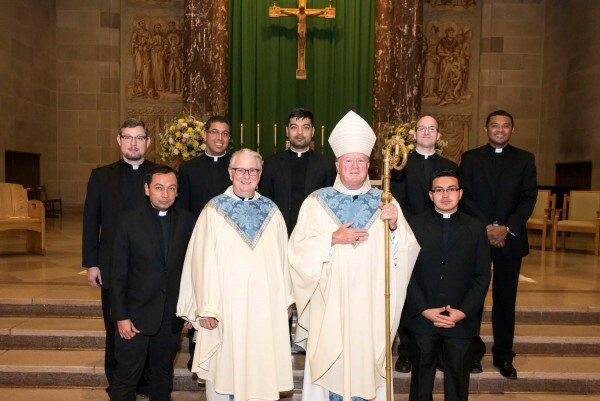 On Thursday, November 17th, 2016, seven seminarians – William Leonard Keown, John Carlos Martine Jusino and John Jeremiah Streifel of the Archdiocese of Baltimore and Javier Julio De Arco, Juan Sebastian Sanchez Guzman, Victor Alonso Sierra Lopez and Henry Ramirez Pinzon of the Diocese of Worcester were admitted into Candidacy by the Most Reverend Robert J. McManus, Bishop of Worcester, MA. Candidacy is a liturgical rite of admission requested by a seminarian of his own Ordinary, which formally acknowledges and enrolls him as a candidate for Sacred Orders. Congratulations! Archbishop William E. Lori celebrated the Installation Mass on Thursday, October 6th in the St. Mary’s Seminary Chapel. Over 150 guests joined the seminarian community for the liturgy and reception. Principal concelebrants included Fr. John Kemper, P.S.S. Provincial of the Society of St. Sulpice, Fr. Robert Leavitt, P.S.S., faculty member and former President Rector (1980-2007) and Fr. Lawrence Terrien, P.S.S., faculty member and former Superior General of the Society of St. Sulpice. For more photos, click on an image in the gallery below. “That’s about as official as it gets,” said Baltimore Archbishop William E. Lori after Sulpician Father Phillip J. Brown signed a profession of faith and oath of fidelity to church teaching Oct. 6. 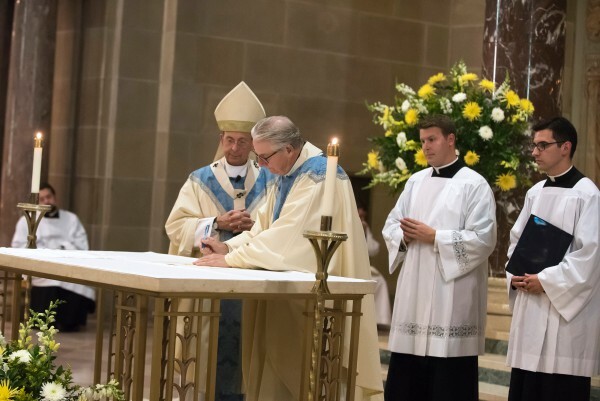 The action followed the liturgy of the word at Father Brown’s installation Mass at the Chapel of the Presentation of the Blessed Virgin Mary at St. Mary’s Seminary and University in Roland Park, where he has been serving as president-rector since July. “I feel your support every day and it is deeply appreciated,” Father Brown told the archbishop after the Mass. Copyright (c) 2016, Catholic Review Media, www.catholicreview.org. All rights reserved. Used with permission. The “Making a Difference Awards” are given to twelve individuals and organizations in the Baltimore area who serve the most needy among us. At the invitation of the Society of St. Sulpice, US Province, St. Mary’s Seminary & University conferred the Degree of Doctor of Divinity, honoris causa to Archbishop Telesphore George Mpundu on Monday, October 6th. Acclaimed as a champion of justice and peace by the faithful and the downtrodden, His Grace has faithfully given witness to the Church’s Social Justice Tradition. He continues to demonstrate his commitment to justice and peace, while exhorting and encouraging others to do likewise. The visit of Archbishop Mpundu to the United States marks the Sulpician Fathers’ Twenty-fifth anniversary of ministry in Zambia. The Archbishop was honored for his contributions as a stalwart herald of the Gospel, an effective pastoral leader and a staunch promoter of priestly formation and in recognition of his unwavering commitment to justice, peace and reconciliation. The ceremony was attended by the seminarian communities of St. Mary’s Seminary & University and the Theological College of the Catholic University of America as well as the Sulpician Provincial Council and invited guests. 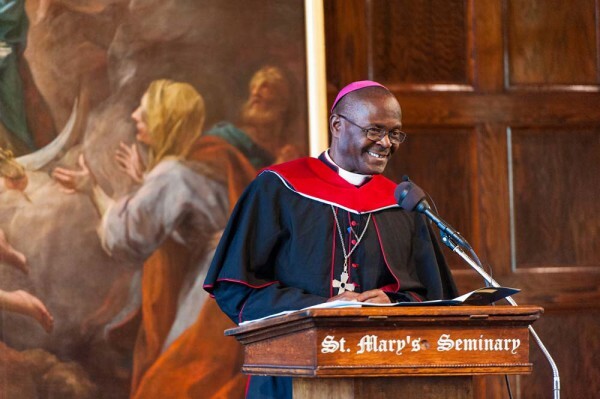 While in the United States Archbishop Mpundu will also be visiting Theological College, Assumption Seminary in San Antonio, Texas and St. Patrick’s Seminary in Menlo Park. More than 125 alumni from St. Charles Seminary in Catonsville.